If you’re like me, it’s very difficult to remember the names of people that you have just met or who you see only occasionally and do not know well. Once, my wife and I attended a church where the pastor, who we really enjoyed, could never remember her name, mispronounced it, or called her something else altogether. We’ve all done it. Once is easily forgotten, but this kind of serial forgetfulness begins to make us feel less of a person, like someone without a name. Frank Zappa can name his kids Dweezle and Moon for whatever weird and inexplicable reasons (although the naming may have had something to do with illegal controlled substances), but naming is a sobering as well as exciting prospect for most of us. A child is born, and we labor over the right name, a name that they will hopefully grow into, aspire to, or be influenced by the legacy of. Somehow, that name becomes a part of their identity and even summons up the essence of who they are or will be. When we say their name, the mere word is a icon for who they are, a way of seeing into the essence of who they will or have already become. Naming, if you recall, is one of the first activities of the Creator. “And God said ‘Let there be light’ and there was light” (Gen. 1:3). After pronouncing it good and separating light from darkness, we’re told that “He called the light Day, and the darkness he called Night” (Gen. 1:5). After a few days he gets around to man, who He says is made in His image, a being named man, meaning Adam. What does the image-bearer do? All we are told is that he is placed in the Garden of Eden “to work it and keep it,” (Gen. 1:15) and even to eat of all but one of its trees. But then it is said that God brought all the animals to Adam and “whatever the man called every living creature, that was its name” (Gen. 1:19). He names, and then we name. We image Him. He even names his woman Eve, which means life-giver, and that having occurred after sin had entered Eden, one wonders if this was a mark of rebellion, God being the only true life-giver. Surely names are given spitefully or in spite of a person’s true character, as well as for more noble reasons. All this is to say that naming is an important part of our cultural task, of what we make of the world --- so important, in fact, that Jesus calls us by name. What does it mean to say he calls us by name? What I take from it is that he is calling us to be who we are in Him, our real Self, the one He created and, but for the brokenness caused by sin, the Self we would be. Calling us by name also demonstrates His sovereignty over us, not the rule of a dictator but the “ownership” of a father over a child and with it the love he has for that child. I am known. I am loved. I am challenged to be who I can be in Christ. Somehow it’s more than (dare I say) simply that He loves us, as amazing as that is. After all, he loves some people I consider annoying or who have habits I detest. What gives? Sure, love means He overlooks those things. But there’s more to it. I think He likes me, that is, the Me that is really Me, the one He made, the one I can be through Him. I think about my own children. I love them like any parent would (or should). More than that, I like them. I like not just who they are but who they can, by God’s grace, become (as they do not always act like who I believe they can be). Sometimes I can see through the things that may annoy me about them to what I really like about them. Then I know that God does the same with me. He knows me. He loves me. He likes me. It’s a big deal to me that there’s a like in His love, that He calls me by name. You’re loved, of course, but have you ever thought about God liking you? 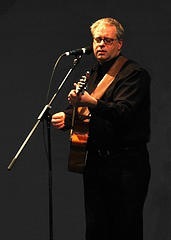 I first met Canadian singer-songwriter Rick Unruh at the annual Cornerstone Music Festival, or maybe the Folk Alliance Convention in Memphis, Tennessee, circa 1999, but frankly, I have forgotten the exact place. Rick is quiet-spoken and unassuming, as are many Canadians it seems. In fact, my Silent Planet Records partner, Tony Shore, used to joke that Rick was so nice that we could tell him we’d put his record out, do nothing for him, and pay him nothing, and he’d say “no problem.” (Well, come to think of it, that’s not far from reality for most record companies!) Even Rick’s songs have a subtle way of sneaking up on you, powerfully understated in their approach. In this episode of Wide Angle Radio, that well-intended but financially underwhelming project of so many years ago, John Fischer interviews Rick in an episode entitled “The Vulnerability of the Artist.” (Funny, no one ever talks about the vulnerability of the record label or artist manager. Can you imagine why?) The acoustic music featured on Wide Angle Radio tends to manifest just that --- vulnerability --- in being stripped down (sometimes, painfully so to my ears today), honest, and often personal. Listen to any song by Julie Miller, who is also featured on this episode, and you’ll sense the vulnerability immediately. Sometimes it’s almost too much. And yet with Rick’s music joy and hope tend to percolate up to the surface time and again. And he’s just as intelligent and articulate and (yes) nice in his interview. So, please check out this episode of Wide Angle Radio here. 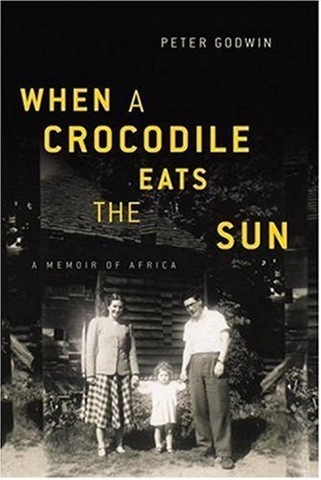 In Peter Godwin’s memoir of Africa, When a Crocodile Eats the Sun, one image serves as a potent metaphor for the political, economic, and social meltdown of Zimbabwe. Godwin’s aged parents, who lived in a house on the edge of Harare, had carefully cultivated a hedge around their home that shielded them from the hawkers, homeless, and thieves who plied the road in front of their home. One evening, after retiring to bed, he is awoken by the smell of smoke. The bougainvillea hedge surrounding their home is burning. As the fire engine takes more than an hour to arrive, the hedge is destroyed and, along with it, their cultivated privacy and sense of security from the near anarchy outside. As Godwin says: “[A]s the day lightens, we see that we are completely exposed, looking directly into the hawker’s camp and the busy throng of curious passersby beyond. . . . My parents have spent the last fifteen years tending this barrier against the huddled masses outside, reinforcing it until they have judged it impregnable, and it has been incinerated in an hour.” The barrier is gone, and with it the illusion of security. They are exposed. Better than anyone I have yet read, Peter Godwin is able to vividly and personably record the sights and sounds of an unraveling civilization, of the impending collapse of a society. An African-born white Zimbabwean, Godwin grew up in a white-ruled Rhodesia under siege from guerilla forces. After white Rhodesians conceded to majority black rule under still governing Robert Mugabe, it initially seemed as if a multi-party, multi-racial democracy might work. Soon, however, Mugabe began “awarding” productive white-run farms to “wovits” (war veterans) and party loyalists. Productivity came to a standstill and, by some accounts, because of famine and oppression, over half the population left the country. Infrastructure fell into disrepair. Opposition political groups were targeted. And while Godwin’s account ends with his father’s death in 2004, we know that nothing has improved since that time. Godwin is able to document this decline well, but more than serving as a political history, the memoir is also a family history. He comes to grip with a secret his father has withheld from him that deeply affects his own identity. He portrays how his parents coped with their decline in status in a society that no longer wanted “colonialists” around. Ultimately, he records his emotional journey to exile from his own country, a sense that his country has been stolen from him and he can longer live there and yet never feel at home anywhere else. With all this misery, there’s not a lot of hope available, particularly for someone who does not embrace Christian faith. Yet, even here, there are both white and black people who demonstrate hope and heroism. In a grocery store line one day, his father finds that he is short of cash. As he begins to give the clerk items to put back on the shelves, a black woman he does not know that is farther back in the line pays the remainder due, something he had done for other black Africans in better times. Faced with an epileptic homeless man outside the gate to his parents’ home one day, Godwin himself sets aside the real danger of AIDS and reaches in the man’s mouth and pulls out his tongue, whereupon his fit settles. There are more such examples, and yet all this is like a narrow crack of light in darkness. The overwhelming emotion that can overtake you in reading such an account is deep sadness over the inhumanity of man, of his great capacity for evil, and of the awesome challenge of bringing hope to a place so charred by despair. While there may not be a prescription here for how to effect change in a country and continent racked by disease, warfare, and corrupt and inept governments, it is a reminder that individual acts of love and charity matter. No amount of financial aid will cure Africa’s troubles. They are desperately in need of not just revival but of a deep and wide reformation that will extend to family, social, economic, and political life. This book is a compellingly human, richly detailed, deeply personal, and richly informative account of a world gone wrong. Yet for hope and salvation, one must look elsewhere. 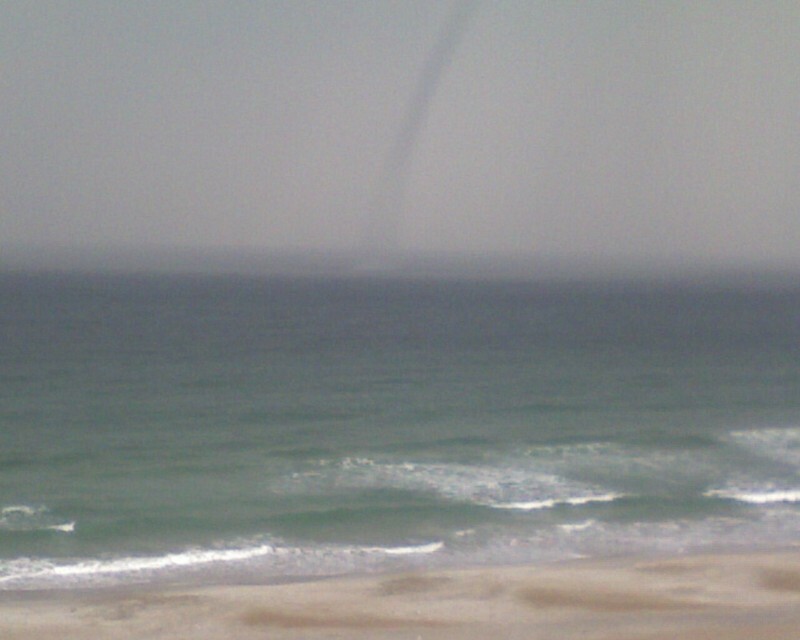 This is the largest waterspout I have ever seen at Wrightsville Beach, North Carolina. Thankfully, it moved south, not coming ashore, and losing definition as it went. It was also lightening and, amazingly, there were people in the water! If you like music and live in the Raleigh, North Carolina area, you are invited to a house concert with the female duo of Alathea on October 3rd. I am a huge fan of this approach to concerts, and an an even bigger fan of this talented duo. Check out the video below to hear them, and for more information, please check the right sidebar under Brookhaven House Concerts. In the Christian imagination, where you live gets equal billing with what you believe. Geography and theology are biblical bedfellows. Everything that the creator God does, and therefore everything that we do, since we are his creatures and can hardly do anything in any other way, is in place. All living is local --- this land, this neighborhood, these trees and streets and houses, this work, these shops and markets. . . . God’s great love and purposes for us is worked out in the messes in our kitchens and backyards, in storms and sins, blue skies, daily work, working with us as we are and not as we should be, and where we are, on “sidewalks in the kingdom,” and not where we would like to be. Although suburbia is much maligned by urbanists and environmentalists for waste of land, stupefying conformity, lack of community, and more, it is where many of us live and make our homes. It is where I have lived all my life --- where I took my first steps, where I played capture the flag and rode bikes, where I had my first “dates” sitting on curb and gutter and walking the streets, where I am still rearing children and dogs and cats. And I love these particular places where I live, so steeped in memories, shaped by walks and gardens, and resonating with the sounds of children playing. For all their faults, much living has been done in these non-rural, non-urban places. They are, inevitably, particular. As Christians we have a faith that is tied to dirt and sky. On the one hand, it is an earthy faith bound to places with names like Ur and Bethlehem and Nazareth and Jerusalem and to a people with names like Urbanus and Stachys and Phlegon and Hermes (Rom. 16:9, 14), believers about whom we know nothing and yet God deemed it important to include their names in His limited revelation to us. Why? Because people are important --- particular people. Because places are important --- particular places. Our faith is not a matter of abstract principles but of truth worked out in a real world full of people and places with names. And yet we’re not left with only dirt. We’re called to view life in light of transcendent truths --- a blue sky of meaning. We see something out of this world, so to speak, in the mundane, ordinariness of this world. Eugene Peterson says that we need “to see these ordinary places where so many of us live as gift-places, as holy sites.” So down the hall, in the kitchen, walking in the backyard, I ask the question “what is God saying to me?” Because I’ve lived in my home, on this particular piece of dirt, for 23 years, it is a place rich in memories. I have to think that in Heaven, all this particularity must have some meaning, that we won’t have a collective amnesia when we arrive there but will bring with us our memories of people and places, memories somehow transformed and deepened in our glorified state, as we see how all things were working for the good of those who love God --- even the places we live and work. I don’t what all of it means. Yet I know that just as Jesus lived in the ordinary and mundane, just as Scripture features the people and places of Palestine, so too the places and communities in which we are rooted have meaning. It’s holy dirt, under a holy sky. Believe that and nothing can ever be the same. Somewhere he read that one of the ways to bring on sleep was to stare at one spot on the ceiling through half-closed eyes until rest came. He chose a small spot near the corner of the ceiling and settled in. Maybe, after all, it was boredom that actually put you under. After a couple of minutes he realized it wasn’t only a spot he was staring at but was actually a line, a jagged line that extended from the spot to the corner. That set him wondering about settling houses, and foundations, and lack of proper support, leading to cracked walls and chimneys and. . . and. . . He turned on his side. 12:30. He had never before noticed how bright the clock radio was, a barely visible timepiece in daytime that was a beacon in the darkness. As well as the red light on the security system panel. And on the smoke alarm. And the VCR. He threw back the covers and, stumbling toward the bathroom, grabbed three washcloths and covered what he could, muting the light somewhat. “There,” he said, to no one in particular, his wife curled in a contented state of slumber, unmoved. Laying back down, he exhaled loudly, just in case someone, just anyone, anyone like maybe his wife, might wake up for a nice chat. Nothing. 12:50. He began counting sheep, white fluffy sheep jumping over a fence. When he reached 100, he began counting backwards, rewinding the moving images, sheep jumping backwards over the fence. Inane, he thought. He considered cleaning out a particularly cluttered drawer in his office, writing a few pages on his latest book, but after a minute or so, his sudden work ethic flagged. He didn’t move. A long, contented exhale from his son’s room brought to mind his father’s deep snore. Had he been this way since childhood? Sleepless? As a matter of fact he did remember lying awake in his bed, more than once, listening to the night sounds, the creaks of the house, the purr of the cat, the furnace coming on and shutting off, car lights streaking around the walls of his bedroom, the somnolent murmurings of Paul, his older brother, who he'd sometimes wake when he couldn't sleep, and who'd always good-naturedly carry a conversation about fishing, school, girls, whatever. A lot of water under the bridge since then! And with that not so pleasant thought, he turned over on his other side, adding a bit of bounce in the turn, hoping, just hoping for response. But his wife dozed on. He’d had some success inducing sleep by thinking about nothing, if you can imagine that. Thinking about nothing is no small task. In fact, if you think about thinking about nothing you're actually thinking about something. No, it’d be more accurate to say he thought about no one thing in particular, or many things momentarily. Kind of like a roulette wheel. You never knew what you were going to get, but it wouldn’t last long whatever it was. But thinking about nothing (or everything) was hard work, a kind of deliberate absent-mindedness or nothingheadedness or mindlessness. He wasn’t sure "nothingheadedness" was even a word, but right then he didn't give a rip. Couldn’t he make up words for himself? Who cared, anyway? At this time of night, he could darn well do as he pleased. They were all asleep anyway --- shutdown, unplugged, hibernating, or whatever. And right there he vowed he would never say "whatever" again just for punctuation, serious wordsmith that he was. Whatever. The dictionary. That tactic had worked before. Twenty words that start with “A,” and on to “B,” and so on. Let’s see. . . asperity, ambivalence, astute, asinine. . . well, that brought to mind several persons. . . but never mind that now. . . argyle, axiom, aardvark (he made a note to check the spelling on that one), amalgam, argumentative, arrogant. Paul . . . Oh, forget it. Paul? He didn't want to think about Paul. This was simply too thought provoking, too big a subject, too emotionally raw to continue when what he needed was no thought, nada, a cessation of conscious brain activity. 2:15. Good grief, he thought. Nothing's working. In desperation, he went to work on the family tree, climbing the branches both ways, paternal and maternal. As he reached his mother's side, images of wiry, hard-baked aunts came to mind with names like Zinna, Rose, and Gladiola, all gone. Dead and gone. Wilted flowers. That wasn't too comforting --- thoughts of death in the bowels of the night. And cousins too --- real honest-to-goodness kissin' cousins like Jennie who chased and tackled him and planted a yucky one on his 10 year-year-old lips and no-good bully cousins like Houston or Junior or "H" or whatever he said call him or else. He realized that the line through good and evil ran right through his family tree, a sobering and philosophical thought for 3:15 a.m. Good grief! 3:15! This is hopeless, he thought. He felt a blanket of impassivity descend on him, a giving up, a calm. . . before the storm, anyway. The last thing he said to Paul was an unrepeatable profanity, at least not the kind of thing he normally said, the kind of thing he would chastise his children for saying. A conversation stopper, for sure, careless words spilling out over nothing, over old pent up feelings of inadequacy, his own failings measured against a practically perfect brother. He stretched his legs out, found a cool place at the end of the sheets, tried to think of something else. Maybe he'd take a walk, he thought. Who said a man couldn't walk in his own neighborhood at 4:00 in the morning? No one, as far as he could tell, though he admitted it was a weird venture. Only his neighbor, excessive-compulsive Kerry Jacobs was up at that hour, and she was doing step-aerobics in purple leotards in front of the bay window. He definitely needed to find something else to think about and quick. He sat up. "Be back later, honey. I'm taking a walk." No answer from the other side. Nothing. He slipped his trousers on, slid his shoes on. Downstairs he grabbed his keys from the key ring by the door. But when his hand touched the doorknob, he paused. He turned and picked up the phone, dialed a familiar number, heard a drowsy voice answer. "Paul, it's me. It's your brother. I can't sleep." When I turned into the parking lot at Wilber’s Barbecue, I felt immediately at home. Most of the vehicles in the lot were American-branded trucks, some new and some old, all sidled up to the side of an unassuming one-story brick building that has been there as long as I have been traveling this road. “Local flavor,” I said to myself, getting out of my car, sandwiched between two oversize trucks that must now cost a fortune to fill up. “Sit where I like?” I asked the hostess, even though the small brown sign said "seat yourself." It felt polite to ask. Wilbur’s is one of those places where women I don’t know can call me “honey” and “baby” and my wife won’t mind one bit. In fact, she’d be appreciative that these ladies are looking after me, making sure I get fed. Mind you, these women are not necessarily attractive, but even were they, it wouldn’t matter much. They’re more like surrogate grandmothers or aunts looking after me, and I feel like a 50-year old kid being doted on, my grandmother standing over me asking repeatedly "what can I get you? you had enough? what else do you need?" I’ve got one thing on my mind. Pork. Pork barbecue. Eastern Carolina–style barbecue—whole hog smoked over an oakwood fire, chopped and dressed with a peppery vinegar sauce. Wilber cooks as many as 30 pigs every day in what must be a hot-as-hell smokehouse out back. Pray he lives to be a hundred, because when Wilbur dies the restaurant has to come into compliance with the a city ordinance and shift to gas cooking. But I digress. I want a large, not-good-for-you portion of savory barbecue, with a cole slaw side and a basket of hush puppies. And don’t forget the very, very sweet tea over crushed ice with a big slice of lemon. Right there. Top of the menu: "Pit Cooked (Oak Wood) Barbecue Pork Plate, Includes: Cole Slaw, Potato Salad and Hush Puppies." I look on down the menu and realize there are only three things on it I won't eat: fried liver, fried gizzards, and stewed oysters. I don't remember having tried gizzards, but I also don't want to try and remember. I’m by myself today, and I don’t regret it at all. I don’t want any distractions. I’m soaking it all up. I don’t want to make any decisions either, so I'm thankful for the limited menu. The biggest decision I had to make was determined by something primal, as in how hungry I would be and when. It was either going to be Wilber’s Barbecue in Goldsboro or Kings in Kinston. I couldn’t make it to Kinston. I firmly believe that if you’re going to be somewhere you need to be there. What I mean is that if you’re traveling in Eastern North Carolina or anywhere for that matter, you need to stop, get out of the air-conditioned car or hotel room, and soak up a little of what it is to be in a particular place. There are precious few places like Wilbur’s left, as homogenized as city business corridors have become. I look around the room. Kitty-cornered to me is a local businessman sitting alone. I know this because he’s dressed in what we big-city folk might call “casual business attire,” only his has a lived in look, his face broadcasting a “I'll sell you something but I'm not in a big hurry to do it" look. I like that. But for my barbecue, I might even strike up a conversation. But I don't want to talk. I want to listen. Behind him there is a table full of antediluvian women, seven to be exact, and one probably seven-year old girl with a round face and stringy brown hair, someone's granddaughter. (Hold on now, no one around here uses big words like antediluvian!) I can't hear what they're saying, but it has to be about recipes and children and men, just as the elderly men behind me at the table are talking about the price of gas and big oil companies and the state of the economy. These are local people. I feel like if I needed anything I could ask any of them and they'd find a way to help me. Mind you, I know that small towns and rural areas have drug dealers, violent crime, and divorce, and maybe I have an idealized vision of small-town life, but still I think it more likely I'd be helped here were I to need it. "You want some 'nana pudding, baby?" I could kiss her. . . almost. I feel like I've been sojourning in a foreign land and stumbled on kinfolk and been invited in for a meal. In the city, I'm not even sure where I could get homemade banana pudding, served room temperature or even slightly warm, with whole vanilla wafers and homemade meringue. I want to stop writing about it and eat some right now. I just ate it slowly, savoring the moment, thinking Jesus would enjoy this meal just as much as I would. He had such a way of enjoying food and drink and yet never clutching it like a glutton but recognizing it for the good gift that it was. Scripture so often places him at a meal, reclining at tables, eating fish on the seaside, eating with his disciples. Sure, He'd be right at home here. It's no sin to appreciate good food. "It was great," I said, paying the bill, and I said I'd be back. Outside, I pause for a moment and look around, adjusting to my new girth. It's 95 degrees and the heat is radiating from a dusty asphalt parking lot a little less truck-heavy now. Wilber's is just a hole in the wall. But it's a little piece of pork heaven right here by the side of US 70 and a comforting reminder that some things don't change. For today, you can have your malls and fast food chain restaurants. 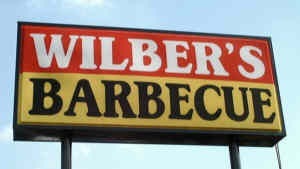 I'll take a very hot eastern North Carolina and Wilber's Barbecue --- just dirt and sky and barbecue. As I drive away, I let the windows down, let the heat pour in and the wind drive away the last lingering smell of barbecue. That's when I said grace.